Figure 35.13. sFLCs in patients with pneumonia compared with other diseases. The slight increase in κ (black) compared with λ sFLC concentrations (blue) may be related to renal impairment. (Courtesy of U. Hoffmann). An early report by Sölling  documented modest increases in sFLCs in a small number of patients with tuberculosis and chronic bronchitis. Elevations in sFLCs were also found in patients with active sarcoidosis, at approximately twice the concentration found in normal individuals. A later study by Hoffman et al. demonstrated elevated levels of polyclonal sFLCs in patients with acute pneumonia (Figure 35.13). Western blots and ELISAs were used to investigate FLCs in murine lung emphysema models, and amounts were found to be increased in serum and lymph node extracts after smoke exposure; sFLCs were also found to be elevated in patients with chronic obstructive pulmonary disease (COPD; n=6) . Further experiments indicated the binding of FLCs to neutrophils and a potential role in the pathology of COPD . Hampson et al. assessed ∑FLC concentrations at baseline as a potential clinical biomarker in alpha 1-antitrypsin deficient (A1ATD) (n=547) and non-A1ATD COPD patients (usual COPD, n=327). On multivariate analysis, elevated ∑FLC concentrations (>44.3 mg/L) were associated with increased mortality in both cohorts (A1ATD, odds ratio (OR): 2.89, p=0.002; usual COPD, OR: 1.80, p=0.009), consistent with other published studies (Sections 35.2, 35.3 and 35.10). 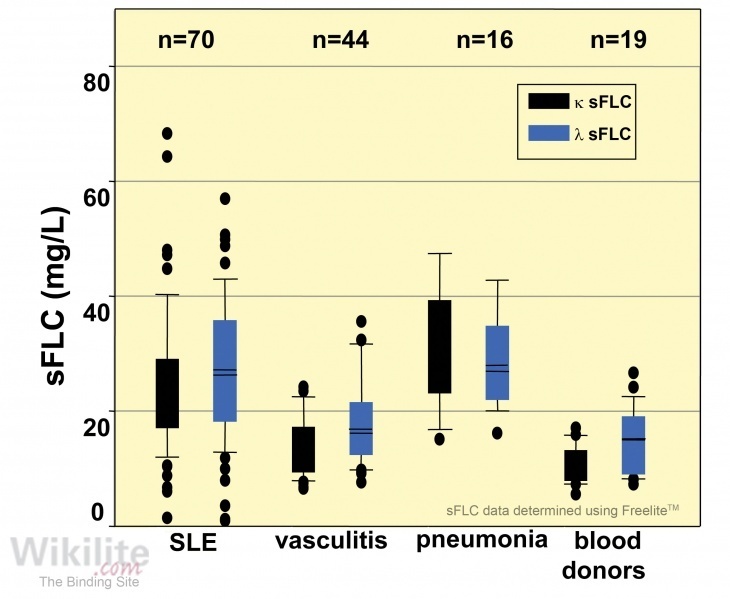 ∑FLC were also higher in A1ATD patients with chronic bronchitis (p=0.019) and airway bacterial colonisation (p=0.008) and the authors concluded that ∑FLC may be a promising biomarker for risk stratification in COPD.